1. Adeloye A, Odeku EL. Congenital subgaleal cysts over the anterior fontanelle in Nigerians. Arch Dis Child 1971;46:95-8. 2. Castro RA, Ribeiro Filho Ade S, Silva VV, Jr. Dermoid cyst of the anterior fontanelle in adults: Case report. Arq Neuropsiquiatr 2007;65:170-2. 3. Bodkin PA, Bhangoo R, Walsh AR, Sgouros S. Beware of the midline scalp lump. J R Soc Med 2004;97:239-41. 4. Glasauer FE, Levy LF, Auchterlonie WC. Congenital inclusion dermoid cyst of the anterior fontanel. J Neurosurg 1978;48:274-8. 5. Hayath S, Seetharam W, Kumari G, Dinakar I, Nightingale F. Congenital dermoid cyst over the anterior fontanelle. Br J Clin Pract 1989;43:119-20. 6. de Aquino HB, de Miranda CC, de Britto Filho CA, Carelli EF, Borges G. Congenital dermoid inclusion cyst over the anterior fontanel: Report of three cases. Arq Neuropsiquiatr 2003;61:448-52. 7. Fermin S, Fernandez-Guerra RA, Lopez-Camacho O, Alvarez R. Congenital dermoid cyst of the anterior fontanel in mestizo-mulatto children. Childs Nerv Syst 2001;17:353-5. 8. Agrawal A, Pratap A, Sinha AK, Agrawal B, Thapa A, Bajracharya T. Epidermoid cyst of anterior fontanelle with clear contents. Surg Neurol 2007;68:313-5. 9. Gellis SS, Feingold M, Adeloye A. Congenital subgaleal cyst over the anterior fontanel. Am J Dis Child 1975;129:843-4. 10. Ogle RF, Jauniaux E. Fetal scalp cysts--dilemmas in diagnosis. Prenat Diagn 1999;19:1157-9. 11. Aslan O, Ozveren F, Kotil K, Ozdemir B, Kuscuoglu U, Bilge T. Congenital dermoid cyst of the anterior fontanelle in Turkish children--four case reports. Neurol Med Chir (Tokyo) 2004;44:150-2. 12. Stokes RB, Saunders CJ, Thaller SR. Bregmatic epidermoid inclusion cyst eroding both calvarial tables. J Craniofac Surg 1996;7:148-50. 13. Moore KR, Fischbein NJ, Harnsberger HR, Shelton C, Glastonbury CM, White DK, et al. Petrous apex cephaloceles. 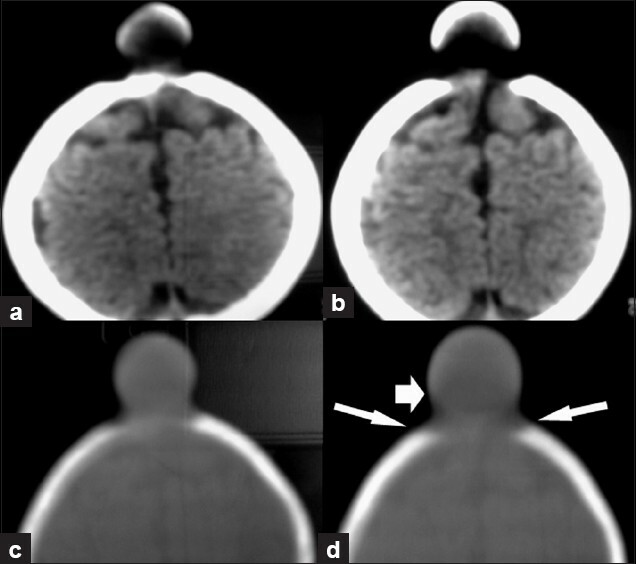 AJNR Am J Neuroradiol 2001;22:1867-71. Dadlani, R. and Ghosal, N. and Hegde, A.S.